This fun assortment of St. Patrick's Day gifts is an eclectic assortment that ranges from Irish Teddy bears and leprechauns to amusing Irish barware that will enhance your celebration. Many of these St. Patrick's Day gifts from The Irish Gift House could perform double duty as decorations or as a costume accessory, but they will all provide entertainment value on high holy day. 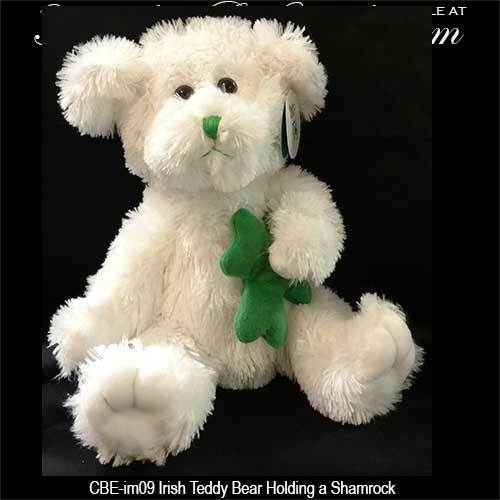 This plush white Irish Teddy bear is holding a green shamrock and he would make a great Irish gift for a child or baby along as an ideal St. Patrick's Day decoration. This plush leprechaun doll with shamrocks makes a kissing sound when activated. This plush green Irish Teddy bear features an embroidered shamrock on his foot and would make a great St. Patrick's Day gift or an ideal Irish baby gift. This plush leprechaun doll with a shamrock is a great baby or child gift idea for St. Patrick's Day. Sorry, this plush leprechaun is sold out until sometime this summer. This Irish frog doll is embroidered with Kiss Me! I'm Irish and would be a cute Irish baby gift for St. Patrick's Day or for any day. These green Irish shades for St. Patrick's Day light up and have 3 different flashing patterns. This green Irish bucket with white shamrocks would be perfect for holding your St. Patrick's Day swag. This Irish Karaoke DVD features 9 favorite Irish pub songs for your St. Patrick's Day party. This metallic Irish confetti features shamrocks, leprechauns and coins. 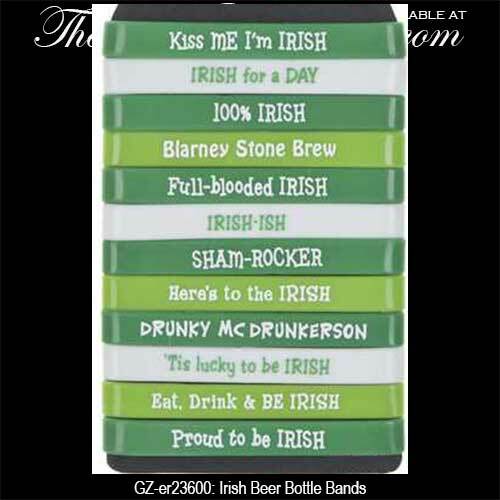 This set of Irish beer bottle bands feature 12 different Irish sayings and three different colors to help you identify your bottle. Mix your favorite drinks in this Irish cocktail shaker with shamrocks. Go Irish is the message on this green Irish lanyard with shamrocks. Kiss Me I'm Irish is the message on this green Irish lanyard with shamrocks. This set of 8 St. Patrick's Day buttons is a great Irish gift to share with friends. This Irish wine bottle cover features a mini t-shirt with shamrocks that says, Irish at Heart. This Irish wine bottle cover features a mini t-shirt with shamrocks that says, Kiss Me I'm Drunkish. This Irish wine bottle cover features a mini t-shirt with shamrocks that says, Here's to the Irish. This small cloth shamrock tote bag is ideal for gift presentation or for St. Patrick's Day party treats and goodies. These jumbo shamrock dice with be the main attraction with any game of luck at your Irish party. These lucky shamrock dice with be the main attraction with any game of chance at your Irish party. This set of 3 plastic St. Patrick's Day shot glasses features witty Irish sayings and shamrocks. This green plastic hurricane glass features a shamrock crazy straw and would be a huge hit at your St. Patrick's Day party. Tap your shamrock shot glass on the bar and it will start flashing indicating that you are ready for another shot of Irish whiskey. That is a real four leaf clover that is encapsulated inside of the oval shaped acrylic charm. 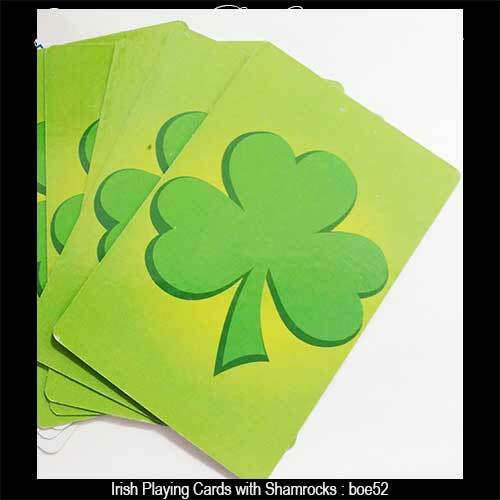 These shamrock playing cards will be a hit at your Irish party or on game night. These Irish mugs with shamrocks are perfect for a frosty brew on St. Patrick's Day. All documents on St. Patrick's Day should be signed with a shamrock pen. 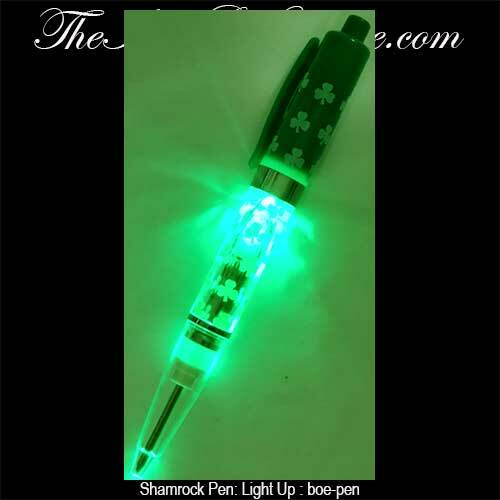 And if at night, you are in luck because this Irish pen lights up. Your coronation begins when you pin on this giant Irish princess button from The Irish Gift House and your reign lasts through St. Patrick's Day. These shamrock cupcake holders are a festive way to present your Irish treats on St. Patrick's Day. Bake your Irish cookies this St. Patrick's Day using these shamrock cookie cutters. These shamrock gift bags from The Irish Gift House are ideal for St. Patrick's Day party treats and goodies. These Irish shot glasses for St. Patrick's Day feature either a leprechaun or a pot of gold. The regular price is $1.95 each. These shamrock shaped party picks have a message of Happy St. Patrick's Day. This mini rubber ducky is green with white shamrocks and would be a fun decoration on St. Patrick's Day or a play toy at bath time. This mini rubber ducky is white with green shamrocks and would be a fun decoration on St. Patrick's Day. You are invited to browse our Irish gifts for the home section to view a huge assortment of items that would also make exceptional gifts on St. Patrick's Day. You will find Irish lamps along with Irish figurines that would add to your home's decor even if you are not having a party. Additional sections at The Irish Gift House include our Irish angels and the Céad Mile Fáilte welcome signs that have a unique greeting made popular by the people who love St. Patrick. Other areas of similar interest include our Irish blessing plaques that have most every verse ever written in Ireland. These plaques would make an exceptional gift for any occasion but would be particularly appreciated on March 17.